‘Tis the season… to hit the road! It’s springtime, which means it’s the perfect time to hit the open road for a fun weekend getaway. Whether you’re headed for warmer temperatures or a few days in the city, sometimes it’s just easier to make it a road trip than traveling by plane. Everyone who has ever been on a road trip knows that there are a few essentials that must make the trip along with you, like maps or a GPS, a good co-pilot, tasty snacks and great tunes. 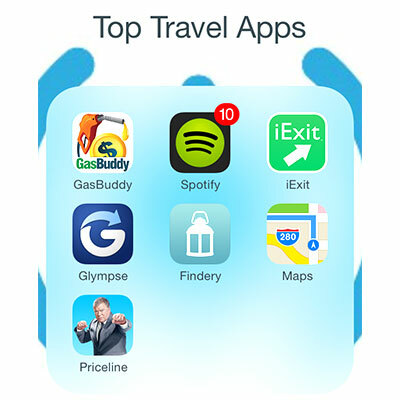 But we’re taking it a step further and sharing our top travel apps for road trips. GasBuddy. There’s nothing worse than spending more than you anticipated on gas to just make it to your final destination. This app updates gas prices in real time, so you can find the cheapest prices on your route. Spotify. Good music is the key to any successful road trip, and with Spotify, you don’t have to make CDs (do people do that anymore?) or spend time searching for the perfect channel. You can make playlists before you leave, search for songs or stations on the go or even use others playlists. The app is free, but the premium service does cost $9.99 a month. iExit. We’ve all been there, waiting as the exits fly by for your fast food restaurant of choice. Rather than wait it out for the next 70 miles until you spot your favorite, use iExit. This app shows you what’s coming up at the exits ahead, so you can be prepared for whatever comes your way. Glympse. Staying safe is critical and that means leaving your phone in your bag or cup holder. Don’t forget, texting and using apps is actually illegal in some towns. Glympse helps you give family and friends updates on how the drive is going by sending your GPS location to them. Findery. The best part of road trips is taking an unexpected detour to try a cool new restaurant, stop at a quirky tourist attraction and more. With Findery, let others do the research for you. Check out their notes on what to visit in specific areas and even leave your own. Google Maps. We couldn’t have a list of top travel apps without including Google Maps. It’s a great choice for a GPS backup while you’re driving to your final destination as well as an easy way to navigate city streets when you get there. Priceline. When it comes to booking a last-minute place to stay, there’s plenty of apps available, but Priceline is one of the best. It includes the ability to book a room from the app, “name your price” or bid on prices and check out reviews, photos and more. Do you have a favorite must-have travel app? Share below!